Mubarak (pictured in 2008) had back surgery in Germany in 2004, and returned there in 2010 to have his gall bladder removed. Cairo (CNN) -- Former Egyptian President Hosni Mubarak was admitted to a hospital Tuesday after complaining to his doctor that he felt unwell, according to a spokesman for the Egyptian military. A military source said Mubarak's condition was stable, not critical, and that his wife and elder son were with him. 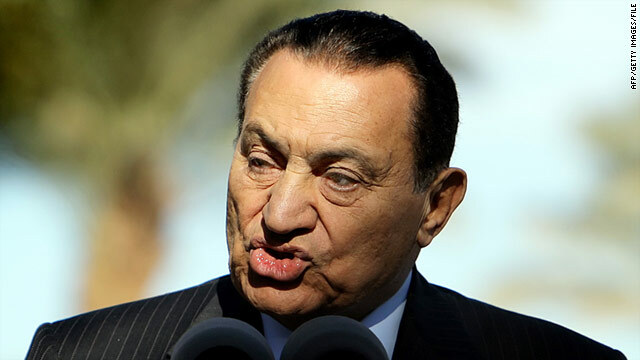 Egyptian state television reported Mubarak suffered a heart attack during questioning over possible corruption charges. When contacted by CNN, however, the prosecutor's office denied any reports Mubarak had been questioned by authorities Tuesday. Egypt's health minister, Ashraf Hatem, later said that Mubarak's condition was stable enough to allow prosecutors to resume questioning at the hospital, according to the state-owned Al Ahram newspaper. Should Hosni Mubarak face charges? Mubarak's sick day a coincidence? The military announced early Wednesday that "questioning of former President Mohamed Hosni Mubarak and his family has started today." Mubarak was hospitalized at Sharm el-Sheikh International Hospital, state media reported. He and his family are believed to have been living on his estate in the Red Sea resort since February 11, when he stepped down and handed power to the military. The hospitalization comes two days after Egypt's chief prosecutor summoned Mubarak for questioning on corruption charges. Mubarak immediately decried the accusations, saying the probe is aimed at tarnishing his reputation and that of his family. In a brief audio message aired Sunday, Mubarak promised he and his family would account for everything they own. He said he agreed to allow the prosecutor to contact governments around the world to take "proper legal steps" to reveal whether he or his family own any property or real estate outside Egypt. Mubarak was brought to Cairo for questioning last month, and Egypt's attorney general issued an order to freeze the assets of Mubarak and his family, and prohibited them from leaving the country. Mubarak had back surgery in Germany in 2004, and returned there in 2010 to have his gall bladder removed. He had largely withdrawn from public view in recent years, until this year's uprising prompted him to make televised speeches. Mubarak ruled Egypt for nearly three decades. His regime was toppled by a groundswell of popular protests that began January 25.